Only the most pathetic football fans rabidly follow the progress of high schoolers as they enter the college recruiting grind. Just kidding! Cue up that Cy-Fair Sam McGuffie youtube, mosey on over to PlayNextLevel.com, and let's get this party started! 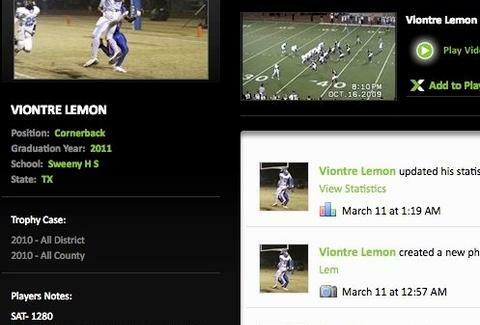 Beta-launched out of Razorback country and endorsed by Chris Mortensen, Next is a clearinghouse for high school and juco players to post highlight videos, stats, pics, and more, so that college scouts can easily target potentially overlooked talent, and you can do the same, only without the pressure of having your family's livelihood depend on it. The site's slick-n-smooth interface is searchable by state/school/position/grad year as well as measurables like weight/40-yd dash/bench/vertical jump, and ranks most-viewed profiles by day/week/month/all time; the best videos follow Mort's advice to "show your best plays early" and "show that you're well rounded" (advantage: nose tackles). Among the most exciting footage is West Monroe (Louisiana) sophomore LB Deano Casola knocking the "prospect" tag off opposing QBs; Sweeny, TX junior CB Viontre Lemon (1280 SAT!) picking off passers, then showing off his own arm cannon; and GA sophomore receiver Cantrell Frazier catching balls on his back twice while soundtracked by a not-at-all dirty Dirty South rap about his own Landmark Christian School ("Yeah we got heart, sportsmanship too, if we hit you/hurt you we get down and pray for you!"). Free for players, and free-for-now for users, other Next functions include saving playlists and "following" players as they update info; in the future, high school coaches will be able to hop on and brag about their disciples, though odds are they probably won't clear the NCAA talent hurdle -- which even Sam McGuffie's been so far unable to JUMP!